Sotirios Boulgaris, a Greek silversmith, moved to Italy with only a few coins in his pocket and opened the first Bulgari shop in 1884. His neo-Hellenic silver jewelry, which combined Byzantine and Islamic elements, enticed English tourists visiting Rome. By the 1920s, the Art Deco movement was in full swing, and Bulgari followed suit, with geometric designs in platinum and diamonds. The house remained in step with current fashions through the ’30s and ’40s, following the dictates from Paris. During this era, Bulgari introduced its snake shaped bracelet watch, Serpenti, which is still one of the company’s most celebrated icons. Bulgari hit its stride in the ’50s and ’60s, rejecting the French approach to jewelry-making and establishing a true Italian style inspired by Greco-Roman classicism, Renaissance art and the Roman school of goldsmiths. The renowned Coin designs, introduced in the late ’60s, define this style, featuring ancient Greek and Roman coins from the personal collection of Nicola, Sotirios’s grandson. 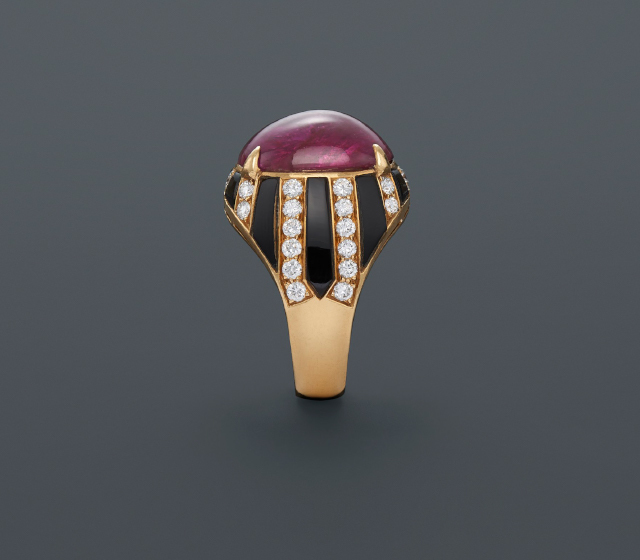 At the same time, the house popularized the cabochon cut in bold, sumptuous jewels that were all about color and curve. It was 1960 in Rome during the filming of Cleopatra that Elizabeth Taylor discovered her two greatest loves: Richard Burton and Bulgari. “Undeniably, one of the biggest advantages to working…in Rome was Bulgari’s nice little shop,” she said. Richard Burton lavished her with jewel after jewel, and joked “the only word Liz knows in Italian is Bulgari.” At an auction of Taylor’s jewelry in 2011, Bulgari paid $20 million to bring some of her pieces back to the company’s archives.